By Cathal Kearney | February 13, 2013. Our regular columnist Cathal Kearney takes a look overseas to see how the Irish footballing talent are fairing each week. 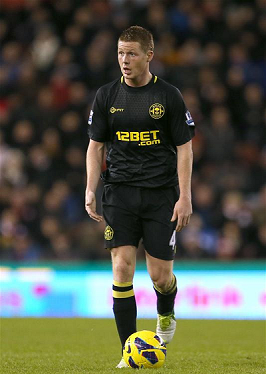 Glasgow-born James McCarthy has been a mainstay in the heart of the Wigan midfield so far this season. However, his side sit precariously above basement side Queens Park Rangers in 19th place and remain firmly entangled in the relegation battle. McCarthy managed some consistency throughout the first half of the season, providing three assists for the Latics, but no goals. His two strikes against QPR in early December are the sum of his goals tally to date, as he has failed to have any impact in games since Christmas. Last Wednesday night McCarthy was selected in the Ireland starting XI to face Poland at the Aviva. He put in a good shift alongside Glenn Whelan against the likes of Borussia Dortmund and national team captain, Jakub Blaszczykowski. The 22-year-old lined up against European champions Chelsea at Stamford Bridge on Saturday, where few expected anything other than a comfortable win for the home side. McCarthy had little joy in the heart of the action, where the creative triumvirate of Eden Hazard, Oscar and Ramires combined to wreak havoc going forward. Chelsea finished 4-1 victors, with all four goals coming from midfielders Frank Lampard, Ramires, Hazard and Marko Marin, highlighting the Blues supremacy in midfield. McCarthy could do little as his side were swept aside, although next week’s away fixture with fellow strugglers Reading will require a big performance from the Republic of Ireland midfielder. Ireland’s spirits dampened after 6-1 defeat in the Aviva.